Grooming is a big part of owning a Samoyed, on this page I will outline the tools and techniques I use to maintain my dogs’ coats, nails and teeth. This is the grooming table I use, it makes brushing and drying them a lot easier. I use a K9-II dog dryer, but you don’t need something as powerful, there are plenty of cheaper alternatives, I just like this one because it does the job quickly. Here is a cheaper dryer that some of my Samoyed owner friends also use. Dremel, I know you might be thinking what does a Dremel have to do with grooming a Samoyed? It’s actually a great tool for keeping their nails nice and trimmed. Use the sanding attachment (the dark brown one) and it will grind the nails quickly and smoothly. For shampoo you don’t really need to spend money on show quality whitening shampoo unless you are planning to show, I only use a specialty shampoo when preparing my dogs for a dog show, for a regular bath I use this shampoo, it is sold at Petco. Conditioning/Detangling spray that you can use during the weekly brush to get the tangles and matts out easier and to moisturize the coat. For the regular weekly brush what I usually do is spray the detangling spray all over the coat, paying particular attention to the more matted areas (behind the ears, on the thighs etc.) then I start gently brushing the dog with the rake, this will get the largest tangles out. Then I line comb using the comb, line combing means you comb the coat in small sections (lines), here is a good video that shows how to line comb. Then I use the Slicker Brush on their legs, brushing them against the grain. To finish off I brush the tail with the pin brush and lightly go over the rest of the coat with it as well, brushing against the grain around the neck. Never use anything but the pin brush on the tail because it is the gentlest brush you have so it won’t break the hair on the tail which regrows very slowly if you damage it. I would not recommend using a Furminator on your Samoyed because it will damage their outer coat. Never shave your Samoyed unless it’s a medical necessity, such as in cases of surgery or hot spots, shaving will damage their coat and make them susceptible to sun burn (see Diagram 1). Trimming your Samoyed with scissors for easier coat maintenance is ok, for a pet cut you can trim their hocks, chest/belly area, buttocks and the feathers on their front legs. I know it may sound complicated at first glance but it really doesn’t take a long time to keep your Samoyed’s coat healthy, takes me about 20 minutes per dog once a week and their coats look great! Bathing is a whole other story as you have to make sure to rinse and then dry your Samoyed very well which is time consuming but you don’t need to bathe a Samoyed very often at all. 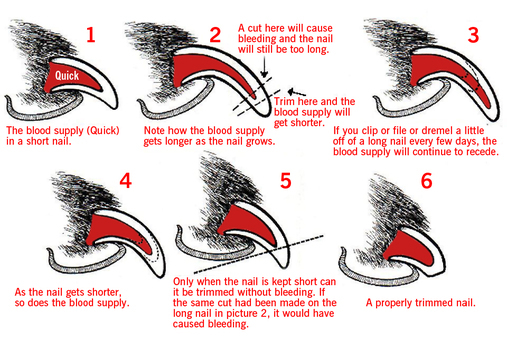 Another important aspect of grooming is keeping your dog’s nails trimmed to a proper length. The nails should not be touching the ground when the dog is standing in their normal stack. Dogs whose nails aren’t trimmed properly and in a timely manner can even develop arthritic changes in their joints which is a very painful condition for the dog so make sure to maintain their nails! If you aren’t confident in your ability to do this yourself just take your dog to any grooming shop where a nail trim usually costs around $5 – $10. The easiest way of keeping my dogs nails trimmed I found is with the use of a Dremel. It might take your dog a little while to get used to the sound it makes so make sure you start slow. During the first session I would just turn the Dremel on and let them get used to the sound, give them lots of praise, treats and encouragement, you don’t have to do any trimming during the first session if you feel your dog is still too scared. Once your dog gets used to the sound start by trimming just one or two nails, again lots of praise and treats. Slowly build this up until your pooch allows you to trim all of their nails. If your dog is very sensitive to their paws being touched in general work on that first before you do anything with the Dremel. Another important part of grooming any dog is taking care of their teeth. Keeping their teeth free from plaque can add up to 4 years to their lifespan as dental disease can cause infections which spread into vital organs. Not to mention your dog cannot tell you if it has a toothache and if you ever had a toothache you know how painful that is! All you need to maintain your pal’s teeth is a doggy toothbrush and some special toothpaste. I use Petrodex Enzymatic Toothpaste and just a simple dog tooth brush from Petco. Just follow the instructions on the toothbrush package to get started, make sure you get both the front and the back teeth! Here is a very helpful picture grooming seminar from the Denver Samoyed Association.